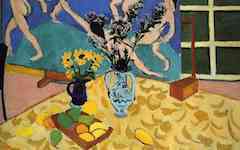 As other writers have pointed out, the maid is an alter ego of Matisse himself and just as he paints fruit on canvas, she places fruit in the bowl.2 There is a correspondence between the action of a painter arranging a picture and a maid composing a table. Even language supports this visual pun because the verbs arranging and composing in the prior sentence are interchangeable, both commonly used about art. 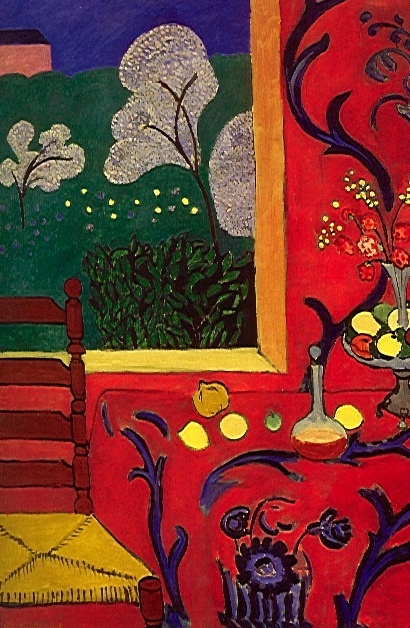 The tablecloth, a traditional (though still unknown) symbol in poetic art for a canvas, is exactly that while the framed window suggests one of Matisse’s own framed paintings. 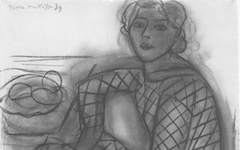 An empty chair at the side of the image was often used by Matisse, and other artists too, to suggest the hidden presence of the artist. The whole image, meanwhile, appears flat not because Matisse was trying to develop a new form of representation, as is often suggested, but because the scene itself is a design for a flat painting: it is "a painting inside his head." The two circular flowers near the bottom edge are hidden substitutes for his eyes. If you compare the blueness and roundness of the flowers to the blank blue eyes of the artist from two self-portraits in 1900, the resemblance is clear. (Click on the image at left to see an enlargement.) Thus, the rest of the scene above his “eyes” is in his mind and red all over to suggest blood. The blue stems, too, are "blue veins" as Matisse makes a connection between the patterns of plant life and our own bodies. As so often in poetic art, we are looking inside the artist’s mind. Detail of Harmony in Red with details of the artist's eyes from two self-portraits, both painted in 1900. Larry Rivers, a 20th century American artist, must have interpreted Matisse’s painting in much the same way because when he painted a variation on Matisse’s composition, he gave Matisse’s maid his own very prominent nose. The maid becomes Rivers himself. Take a look. Original Publication Date on EPPH: 26 Jul 2010. © Simon Abrahams. Articles on this site are the copyright of Simon Abrahams. To use copyrighted material in print or other media for purposes beyond 'fair use', you must obtain permission from the copyright owner. Websites may link to this page without permission (please do) but may not reproduce the material on their own site without crediting Simon Abrahams and EPPH.